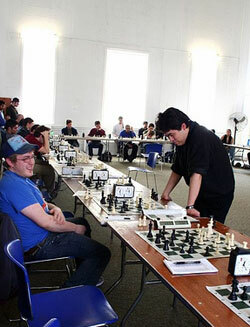 On March 24, the Columbia University Chess Club organized a simultaneous exhibition with GM Hikaru Nakamura. Thirty Columbia students and other guests, all rated below 2200, took on the highest rated player in the country hoping to put up a fight or at least learn a few tricks from the grandmaster. I asked Hikaru before the simul started "so what's the score going to be?" and he said (after a brief deliberation) 29.5-.5. I told him, "We will hold you accountable." Black is still winning after this move but 28...Bf4! was curtains. 37.Rd7 hxg3 38.hxg3 Rc5 39.Rxb7 Rxa5 40.Rd7 Ra3+ is not simple either. 37...Rc3+ 38.Ke4 hxg3 39.hxg3 Ra3 40.Ra8; 37...Rd6; 37...hxg3 38.hxg3 Rd6 39.Ra8 Rd7 was the best try, although Black still has work to do. Despite these rough patches, when the smoke cleared Hikaru compiled 28 wins, one draw (against Travis Patay), and one loss (against Jake Vogel). Not bad at all, but slightly below his pre-simul expectation! The event was a great success from the chess club's point of view with dozens of spectators stopping by despite the last minute change of location (the intention to hold the simul outdoors was scrapped due to inadequate weather). It is disconcerting, however, that this was the first time in many years that the club had organized anything noteworthy—a state of affairs that is not unusual to most universities across the U.S. Other than the Pan-Ams (and events organized by UTD/UMBC) there are only sporadic events here and there, and even then, one rarely hears about them. Certainly, there are unpleasant administrative hurdles to overcome in raising the funding for a big event on a university campus. Yes, students graduate, transfer, and leave the school, which makes it difficult to ensure continuity. The fact that it is not easy to find strong players on campus—of course with the exception of UTD and UMBC—doesn't help either (although, a small trivia note, one of Columbia's most famous drop-outs is Jose Raul Capablanca, who attended the university for a semester hoping to…play baseball!). But these arguments hardly justify the prevailing apathy with relation to chess in a setting that, on paper, should be so favorably predisposed. Every year, the Harvard and Yale rivalry reaches its peak in a football game whose pure quality can hardly be eulogized. Wouldn't it be far more appropriate to highlight this rivalry between two of the nation's leading academic institutions in arguably the most 'intellectual' of sports? Surely one is a dreamer to think that the popularity of chess will surpass that of the major sports in the foreseeable future. Hence, it is reasonable to conclude that such aspirations are futile (to begin with, a fundamental change must take place in the nature of academic institutions). Indeed, chess is doomed to remain far away from the limelight, even in the academia, unless a few good men take initiative and begin to organize events, attract the public's attention, and demand more funding from their own administration. There are many good moves at one's disposal; for example, it is easy enough to make one-day intercollegiate meetings a tradition (as it is, colleges meet for such matches every now and then) with designated dates and a hosting university. Holding a local university championship is even easier. On the other hand, establishing a USCL-like intercollegiate competition requires substantially more effort, but could still be a realistic long-term goal. There is just one blunder to avoid: make no moves and your time will run out!